After what has seemed like an interminable amount of time I can finally show you my latest project. I started about a year ago working on square motifs that could be used for a larger project like a shawl. I wanted something that was not too open so that it could be made in a thicker thread which would work up faster and still be lacy. Then I got side tracked and started working on hearts and one thing led to another. I've been trying to keep up with work and the 25 Motif Challenge and the Round Robins and the Design-Tat course and more recently I've been teaching the seniors to tat at the local rec centre, in between which we've had some fun going on with car repairs and the launch of new software and... Well, you get the idea. Today I finally managed to get the first few copies of my newest book done. 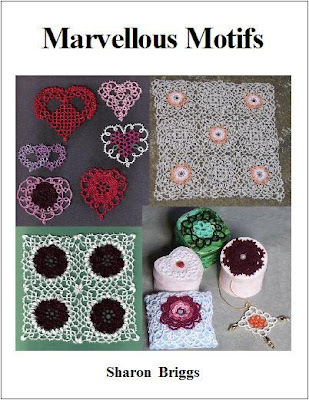 Marvellous Motifs containing 19 versatile patterns. Here's a sneak peek of the front cover. Ordering information will be posted as soon as I know what the shipping costs will be. I was able to get to the post office and get the shipping costs so here's the price in Canadian funds including shipping. 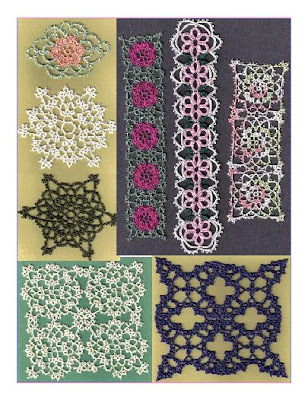 tatdlace at gagechek dot com. Well I'm totally exhausted just reading about what you've been doing! Love the look of the patterns. Waiting with bated breath to find out what the mailing costs to the UK will be. Looks super. You work so hard Sharon, you must be challenging Superwoman! You ARE such a busy (and productive) woman! I'll have to put it on my list for now, but I expect to hear many good comments about it. Congratulations on your new book, Sharon. Marvelous designs. You are amazing yourself, being able to do so manage so many things at one time.